There is something about having a drink or two in one of New York’s hotel bars that can make either an in-house guest or an off-the-street city resident, feel fabulous. Off the clean and modern lines of Le Parker Meridien’s lobby is the setting of what resembles an aged gothic cathedral. Through the wrought iron gates, past the glowing table of prayer candles, below the giant wrought iron chandeliers, and amongst the hefty red curtain is Knave. The impression of Knave could be considered just that, deceitful. However, there is nothing unreliable about Knave, especially when it comes to the cocktails. With rows of intimate cocktail tables lining the mirrored walls, the dim lights, and music to the likes of Edith Piaf, Norah Jones, and Louis Armstrong the setting is prime for a pre-dinner aperitif. While sitting amidst the after work crowd, lovers on holiday, and those conducting late business meetings, one can mingle within the confines of his/her area or sit back and take pleasure in one of Knave’s carefully concocted adult beverages or a glass of their fine wines and spirits. Elderflower Spritz? St. Germaine, Prosecco, with a bitter twist of lemon…yum. While tasty noshes are offered (hummus, artisanal cheese, and cured meats), forgo the extra spending and snack on the plethora of complimentary treats (deep fried olives, mixed nuts, and smoked almonds). The staff of Le Parker Meridien and that of Knave will have you feeling top class upon your exit. Continue your evening in Midtown, with dinner at Estiatorio Milos. This Mediterranean hotspot proudly holds the foundation of “the idea is perfect simplicity,” and patrons will find just that, food and service that surpasses the standards set for any prime city restaurant. From the minute you walk through the door, the focus is immediately “You”. The initial ambiance gives guests the feeling of walking-in off the streets of lively New York City and entering the realm of the even more energetic coast of the Mediterranean. Upon being seated you can forgo the thoughts of Spanakopita and Moussaka (the N train to Astoria is close by for these items), as your eye will instantly be drawn to the display of fresh fish that Milos calls “The Market.” This is an open exhibit of Milo’s daily seafood selection. All items are beautifully displayed over ice for consumers to inspect and choose from. The whole fish is then weighted for market price, cooked, and presented. Don’t hesitate to ask your server to describe each of the products that are available for that day. Their knowledge of the seafood (and the rest of the food for that matter) is extensive and impressive. 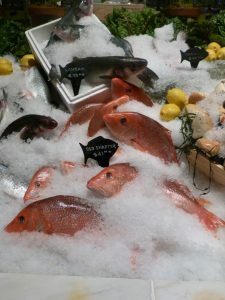 Want to know how fresh the seafood really is? 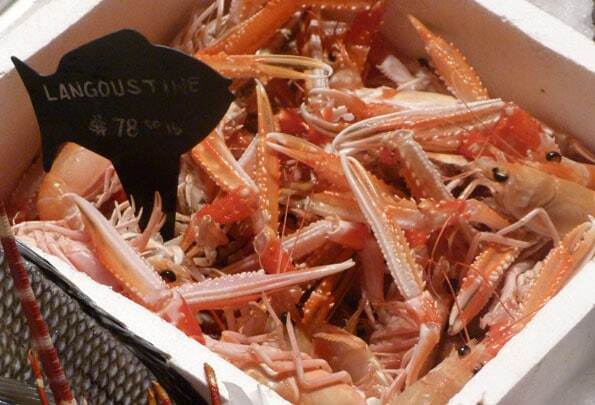 Just watch the langoustine and langosta. Yes, they are moving. 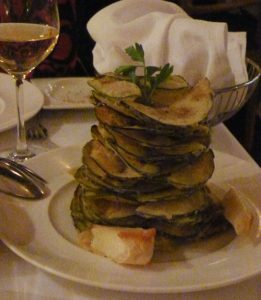 If you don’t know where to begin when perusing the menu, order the Milos Special, (an impressive stack of thinly sliced and lightly fried zucchini and eggplant, alongside a tart tzatziki sauce and saganaki cheese), and let your server select the rest for you. Note that all dishes are served on a larger scale and are meant to be shared. Our delightful server, Allison, started us off with the Octopus that was so fresh you could eat it raw, but we didn’t. We had it prepared charbroiled with its perfectly seasoned accompaniment, revythada (fancy word for chickpeas). The Sardines were also charbroiled and merely drizzled with extra virgin olive oil, lemon, and oregano. This plate had my hesitant dining partner in “La La Land” for the rest of the first course. Moving to the entrée portion of the meal, my companion and I shared the Balada selected straight from “The Market.” This is a white fish from Portugal with a buttery flavor and unctuous mouth-feel that seemed to disappear the moment the meat hit our tongues. Partnered with the flakey fish, the Tomato Salad was full of savor and clean ingredients. Think of this salad as an authentic Greek salad minus the lettuce. Just when we thought we had had enough, Allison approached our table with the dessert menu. As she had been spot-on with the previous meal selections, we put it in her hands for our dessert as well. The ever-popular Loukoumades (small fritters of light dough and cinnamon) were drizzled with honey-syrup making it ever so easy to pop more than one of these puffy clouds straight into your mouth. The house-made Lavender Ice Cream has the ability to tame any sweet tooth with a mere floral spoonful…or bowlful! With the desire to portray Mediterranean cuisine at its best, all of the ingredients on the menu have been selected from the finest of sources of their kind. Also, because the chef has outlined the menu with a minimal number of ingredients, he has the ability to maximize the quality with the highest there is to find. A high-end evening in Midtown doesn’t happen every night, so why not make it a bit of an event. Whether you’re a local meeting up for a drink and dinner, or a traveler out for a memorable experience, Knave in the Le Parker Meridien and Estiatorio Milos will certainly have you feeling like five stars. Native Texan moved to New York to attend culinary school (French Culinary Institute). After falling in love with the city, New York quickly became her, "home." Hailee currently works in the kitchen at the Four Seasons Hotel. Hailee enjoys reading, writing, marathon running, and has an addiction to Scrabble. She lives in the Bronx with her husband, Rogers and family, Marie and Laura.